Judy Webby of Wanganui Arts Society with her painting depicting an old barn on the O'Leary farm. Artworks on show at Whanganui's Cooks Gallery cover a broad spectrum of mediums and a wide variety of artists. The Wanganui Arts Society Annual Exhibition includes a painting by most senior member Hilde Sutton through to a work by a young, junior member of the society. "We have had a few new members join this year and we are always looking for more," says long-serving member Judy Webby. The society is Whanganui's oldest arts collective, formed in 1901, and there have been intergenerational memberships and family groups involved over the decades. 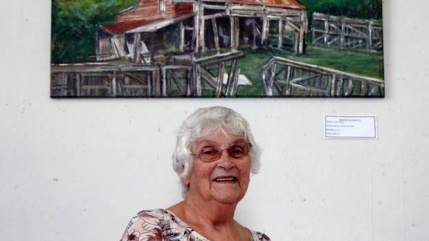 Webby, a former art teacher at Whanganui High School, has some of her own paintings on show including a scene of the O'Leary farm. Painter and potter John Singleton has a selection of his two and three-dimensional works on show and there are paintings by Richard Cotgrove, former WHS student Stephanie Lockwood and Heather Spooner. "Our members work in a diverse range of mediums and there are some beautiful works in this show," says Webby. "They provide some excellent examples of the width and depth of experience and disciplines." Most of the works are for sale and will make perfect Christmas gifts says Webby. Wanganui Arts Society Annual Exhibition. Cooks Gallery, until December 23. Open Saturday 10am-2pm; Monday and Tuesday 10am-3pm.